The Sermons Online Publishing System is a comprehensive solution for publishing rich-content sermons. The system consists of a desktop Publisher application, a web-based Site Manager, and media hosting services. Few web hosts provide the specialized environment needed to publish sermon audio and video. At Sermons Online, hosting sermons is all we do. We are a companion service to your web site, adding the capabilities you'll need to get your sermons online. Record your sermon on a multimedia device, file, CD, or tape. Publish the sermon to the web using our free, easy-to-use Sermon Publisher. As soon as the Publisher finishes uploading your files, your sermon immediately appears on your church's web site. Visitors browse your web site to find sermons. Sermons can be played back online, downloaded, or podcast. Sermon Hosting is provided in units of 1 gigabyte (GB) of disk space. Each GB is typically enough for a year's worth of weekly audio sermons, or about 2-3 months of video sermons. You have complete control over the size of your online sermon archive: you can keep some sermons online permanently and remove others after a period of time. There are no special fees for video files vs. audio files. The cost of the service is measured only by the disk space used. Audio will typically use about 15MB of space per sermon, and video will use about 120MB per sermon. Audio Feed - A feed of your most recent sermons is published each time you add a new sermon to your archive. Visitors can subscribe to your feed to automatically download your latest sermon. Feeds are compatible with Apple iTunes®, Google Homepage, My Yahoo, Universal Subscription Mechanism (USM), Podcast:, Feed:, and RSS 2.0. Online Donations - A donations link can be displayed at the bottom of your sermon pages. This link points to a Paypal Donations payment page for your ministry. 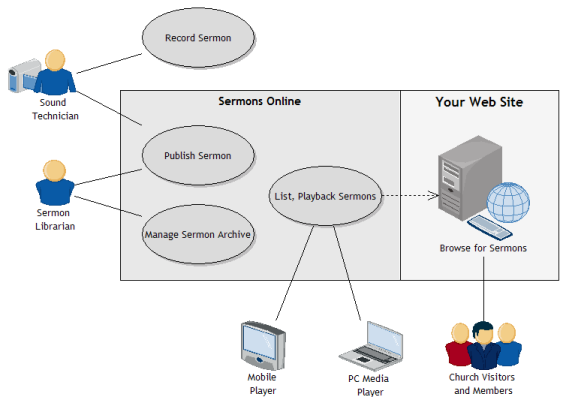 Usage Tracking - The Sermons Online service tracks the usage of your sermon web pages, podcasts, and sermon files. The results of this tracking are displayed on your Sermon Admin home page. The Sermon Publisher is free software that we provide to you to streamline the process of publishing your sermons. The Publisher uses a familiar Windows-style interface to walk you step-by-step through the publishing process. To help your visitors find sermons of interest to them, the Publisher indexes your sermons by Date, Title, Author, Series/Topic, and Scripture reference. Scripture references are automatically linked to the Bible Gateway, the largest online source of Bible translations. The Publisher provides a full WYSIWYG rich-text editor with HTML support for adding notes or outlines to your sermon. You can copy and paste your notes directly from Word, or type them in yourself. You can also attach a document file to your sermon - an ideal way to make your church bulletin available online. Your sermon can be published with up to four streaming audio or video files, in any combination of Windows Media, MP3, Real Media, or QuickTime formats -- enough to provide maximum compatibility and audience coverage. The Publisher also comes bundled with open source applications for audio and video processing tasks such as extracting audio from CDs or recording WAV files. Sermon Hosting $15 per month per gigabyte (GB) of disk space used. Usage is rounded up to the nearest GB. Bandwidth Budget 20GB of data transfers per month. Free Evaluation You may use 1GB for free for the first month. At the end of each month, your account will be charged for the units of disk space that you have used, and a statement will be emailed to your billing point-of-contact. Payments can be made online via credit card or PayPal, by mail, or by automatic payment (preferred). You may cancel the service at any time.